I really like doing rides for the first time. The Tahoe rim ride has been on my bucket list for a while, but its hard to get in. The ride starts and ends near Spooner lake, on the east side of lake Tahoe, about 15 miles north of the city of South Lake Tahoe. The basecamp is the definition of small- so small in fact that only 15 or so rigs will fit. Ride management holds a lottery each year and draws entries from a hat and makes 15 or so people really happy. Each entry selected has to bring at least 2 horses, hopefully three. I didn’t win the drawing, but was invited to join Beth Kaufman and Gretchen Montgomery in Beth’s rig. Yay! Lucky me! But as usually happens, things get twisted. Nevada wonder rider Connie Creech wanted to go, as did another guy I don’t know. Normally I’d do anything on the planet for Connie, but give up my spot at this ride? Don’t think so! Beth formulated a good plan that had Connie and Gretchen go with her, and I’d get in with the other guy in his rig. Then Kristin Ojala, who had been selected in the drawing, was going to bring her rig and bring Ines Hoffman and her spunky mare Kalika. Then Kristin’s mare Lani got injured in a fence incident, so she was out, leaving Ines without a ride. Ines could take Kristin’s trailer spot but only has a 1 horse trailer. (It’s so cute!) Then the other guy canceled, creating the perfect storm. I’d take Kristin’s spot with my rig with Sorsha, I’d bring Ines, then Connie, Beth, and Gretchen would all come together. Whew! Ride management gets a logistical workout in this one for sure! Manager Alisanne Steele did an incredible job. This was one of the best run rides I have ever attended. They drew big chalk boxes with numbers in the parking area where each rig would go. They measure the rig as it enters camp and slot each rig in to the best spot. (see the picture) That’s the whole camp! Brenda Benkley came in her rig with Laura Fend and Jenni Smith. On Friday afternoon Gretchen, Ines, and I went on a nice warm up ride up the trail for a half hour or so. I was pleasantly surprised to find out that management was providing a free Pizza dinner on Friday night for the riders. 3 slices, 2 beers, and a cookie. Nice! Kalika and Sorsha became best friends on the trailer and never uttered even a peep all night, except for the eating. More Nice! The camp was at 7000 feet and was supposed to hit the 40s at night, but it was very pleasant, and I doubt it got below the mid 50s. The first 5 or 6 miles go uphill on great forest single track trails. It’s a climb, not super steep, but it can be deceiving since you just keep going up. I was in front and we were moving. Now’s a good time to let her out a little, and boy, I was pleased. I have not felt horsepower like this since riding Warpaint. She has a motor on her, and was just blazing up that trail without even feeling it. Wow! We slowed down after a few minutes, but those first few minutes were very exciting, and worth the price of admission. Wait till this horse gets really fit! Once we started moving she was just great; no issues at all. We took turns leading up the mountain at a great pace- trot, walk, trot, repeat. I thought this was pretty country. Huh. We ended up near the top of the mountain range at 9000 feet and had to walk a mile or so of really gnarly, rocky, technical trail along the top of the mountain. Once at the top you look to the left and it takes your breath away. There was lake Tahoe to our left; we were 2000 feet above it. It was like being in a plane. I still can’t believe that view. We were trotting along at 9000 feet on the top of the ridge, and then headed down on forested trails that were very nice with just a little bit of stopping required for rocks. Once past the big intersection with the water we went downhill on a mountain road a long, long way and picked up a road heading sort of east that headed around the mountain on the other side. We started climbing again up a long slight grade, all trottable, until we were near the top again on the other side. Off to my left was Washoe valley in Nevada! We were about 4000 feet above the lake, and it was full. This view was just as amazing. We kept going up and up, finally reaching the summit, and then it was full down again to the first vet check at 18 miles next to a lake that could have been in Switzerland. Boy it was pretty in there. Our trot out was on top of the lake’s dam. The 45 minutes went pretty quick, but the spread for the riders was incredible. Ice chests full of sandwiches, drinks, BEER!, treats, chips, fruit, vegies, brownies, candy, the works. It was plush! Now we headed out on the yellow loop and started climbing through a forest of Mule Ear plants. This was another long, long climb that twisted its way up the mountain on single track. More trot, walk, trot, repeat. It took a while to climb all the way back to the tippy top of the mountain, but at the summit we got to see that view again. This time we turned east and began a long, steep, downhill down the back of the mountain. There were no trees, just high meadows with lupin blooming as far as you can see, and the smell was amazing! We led down the mountain on foot until we got to the bogs. (we got treated to a little of everything in this ride) It was swampy and wet for a mile or so, but the green grass everywhere was a treat for the horses. I walked it on foot and my shoes got just a little wet. Lucy was a little worried about the swampy conditions after her last incident where she got Fergus stuck in the mud at the VD Doozie ride. At the bottom we mounted back up and went about 5 miles through the forest on rolling jeep roads back to the vet check for our second 45 minute hold at that same beautiful lake. Once back on the trail we got the deluxe treatment. Down the hill to the Flume trail, which was a long road that used to be the water supply for Virginia City. There are lots of old remains of pipes, stations, and of course a lot of water. This road ended at the sand climb- a half mile straight up on a sandy road. I had Sorsha tail me up, and at the top I was ready for a drink! There was water for the horses at the top- very nice. We then entered what I’d describe as little Yosemite. It was a few miles of incredible trails through mountains of rock. The trails were dirt, but they went through the solid rock mountains. It required a lot of walking, but it was really pretty. This took us to the “dry” lake that was full of water. Here we picked up more rocky uphill trails, where we had to ride around some residual snow, that eventually led to a long downhill road to the beautiful Marlette lake. We rode right to the shore where a fly fisherman made Sorsha jump when he cast his line that sparkled in the sunlight. Here’s where the fun began. 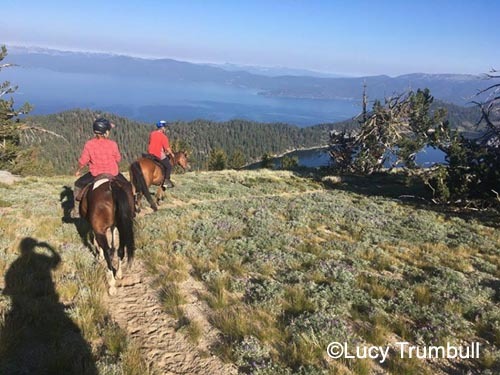 The last 8 miles of the ride head back to camp on the Spooner lake trail, a single track trail made for horses to trot on. And REALLY trot on. First a little climb at a walk across several wooden bridges, then it flattens out and goes for about 6 miles of pure enjoyment. Sorsha was in front and really moving. We just flew down this trail with me leading, Sorsha on the gas and in perfect rhythm. We were going way faster than normal, but how could you not? Gretchen and Lucy were behind me, whooping and laughing. That 6 miles was as much fun as I have had on a horse in a while! It was over WAY to soon for my taste. This magic ended at a road that led over to Spooner lake and led us along the shore where there were lots of people hiking, camping, and biking since we were close to civilization now. Gretchen was leading on Coquette with me behind her when they rounded a turn at a nice trot and discovered a log halfway around the trail. Coquette did a major spook; I promised Gretchen I would not rat her out, but let’s just say that she was smiling when she remounted! Only a mile and a half from the finish! We trotted along the lake and walked back up and down the short trail that led to the main road and the camp. We finished about 5:45 pm with 5 horses behind us I think. We took the kids to the post ride vet and found Sorsha’s post ride pulse to be 36. Yep. Susan said “very nice! Did you ride her?” Got me a keeper here. Suzanne ford Huff got second, Ines and Jenni came in 5th and 6th, and Laura and Brenda finished about 20 minutes ahead of us. Lucy and Roo finished and became a decade team! We are all very proud of them. The ride continued its greatness by providing a taco bar for the ride dinner- it was perfect. Nice awards, especially for the top ten. We had a great post ride party at Brenda’s camper as the sun went down with everyone from camp there in a huge circle. People passed around bottles of things to drink- it was fun. My final comments? The ride was terrible! Awful! Never come here, don’t even enter! There. Now my odds of getting my name pulled in the drawing will be increased. You can bet I’ll be sending in another entry next year! Initially, Plan A was Fergus — Wonder Pony, Golden Boy, two-time Tevis finisher. But Fergus has been NQR this year, and a final “Go/No-Go” ride determined that this would be a “No Go” year for him. Thus, Plan B: Roo. Roo, the 50-mile reliable worker bee. Roo, who had tried Tevis in 2009 and made it to 64 miles before deciding he was done playing for the day. He had a base, he had done “spring training” alongside Fergus, and he was well-rested. And Lucy really wanted to be a part of the “snow year” alternate starting location/Duncan Canyon trail. So, with the above in mind, the “A” goal for Plan B was just get to Robinson Flat. No expectations of finishing, just “get as far as he gets.” Roo is very self-preserving and sensible — when he is done playing for the day, he’ll stop. Robinson Flat was the goal, and any more than that was just bonus points.